Fondant funnel for portion of sauce etc. Holder can be bought separately. 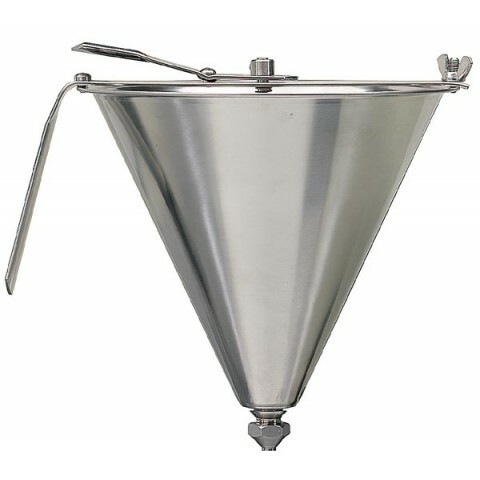 At the Fondant Funnel Jonas there is a possibility to adjust the height of the center peg which opens and shuts the flow of liquid. The adjusting makes it possible to choose how quick the liquid runs out through the bottom hole. 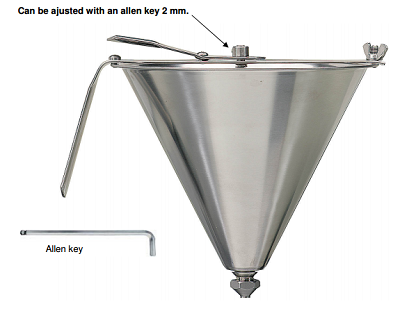 You can do the adjusting in one single operation with a key size 2 mm. The higher up you fasten the collar, the smaller opening when pushing down the opening mechanism. The peg can get stuck in an open position if the collar is mounted/adjusted incorrect (too low). 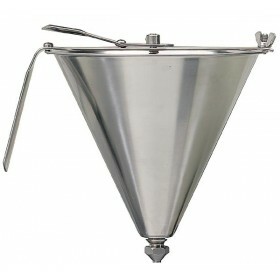 To secure that this wont happen, press down the opening mechanism a couple of times without liquid in the fondant funnel. If the peg moves without getting stuck on the edge it's ready to use.